Richard Garriott's story begins with an Apple II and a dream. At eighteen, he spent his entire life savings -- two hundred dollars -- to produce Akalabeth, his first video game. That covered the floppy discs and the Ziploc bags the game was sold in; his mother drew the cover art. The first week they sold maybe a dozen copies, but soon after, the California Pacific Computer Company came calling, asking to publish the game. These were the Wild West days of the game industry -- hard partying, outrageous personalities, and fledgling studios trying to make a quick buck. Never could Richard have foreseen that this would become a multibillion-dollar industry with the top games eclipsing even Hollywood's highest grossing films. He would go on to launch Ultima, a seminal series of role-playing games. Ultima Online was the first massively multiplayer online role-playing game (MMORPG), and one of Time's 100 greatest video games ever. Throughout, Richard has aspired to build the most lifelike gaming worlds possible, allowing players to interact with every object on the screen, experience consequences for moral transgressions, and fully personalize their gaming journey. Away from the screen, Richard has also pushed the limits of human experience. A lifelong adventurer, he has plumbed the depths of the Atlantic Ocean to see the remains of the Titanic and hunted for meteorites in Antarctica, and in 2008 he became one of the first private citizens to travel into space. In 2014, Maxim named him one of the "Six Most Interesting Men You Can Actually Meet." Here, in his own words, is his extraordinary life story. 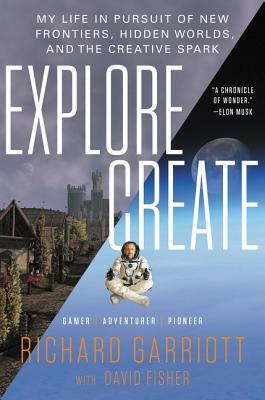 Filled with interactive tie-ins and challenges, Explore/Create is unlike any other memoir, an unforgettable ode to exploration and discovery that will spark the creative impulse in all of us. Richard Garriott founded the gaming companies Origin Systems, Destination Games, and most recently Portalarium. His Ultima series has sold millions of copies worldwide. In 2008, Richard rode Soyuz TMA-13 to the International Space Station, becoming the first American second-generation space traveler. He lives in New York City with his wife, Laetitia, and their two children. David Fisher is the author or coauthor of dozens of books, including 22 New York Times bestsellers. He has worked with George Burns, Johnnie Cochran, and Terry Bradshaw, among others. He lives in New York City.